CLIFF ¼” S2 Jack Sockets with black plastic nut; slotted ring and hex nut options are also available. 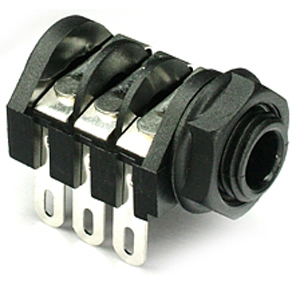 Sockets can be supplied in various orientations , mono or stereo, switching or non-switching, PCB mount or lugs. CLIFF ¼" S4 Jack Sockets with internal chrome metal bush and black plastic bezel. CLIFF ¼" Stereo Switched Jack Sockets for vertical PC mounting. JY066 CLIFF PC mounting ¼" Stereo Jack Sockets with isolated switch contacts. 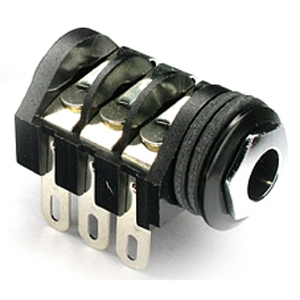 JY062 CLIFF Low profile ¼" PC mounting stereo socket. Similar to JY066 but only 12mm above PCB. S8 CLIFF Compact ¼" Jack Socket PC type. Panel Mount, Both Mono and Stereo, Metal Shell.